hi there! what type of wardrobe door did you use for this and how did you cut them to keep the edge in tact? we are doing the same thing with Hemnes but Ikea doesn’t sell doors for that set. Hi Suzanne! My husband says he bought the hemnes wardrobe doors (they may be originally used as sliders), cut the sides down to fit without going past the seam, and then added our own hardware. I hope that helps! Having struggled to build bookcases from scratch, I will never again after seeing how beautiful yours came together. Can you tell me what piece you guys use for the top compartment. Trying to figure that out without success. Thanks. Thank you Janet! I do not see it on the website but it was a bridge that was sold to connect two bookcases. My husband bought two and installed them together to be long enough to cover all 3 bookcases. He had to cut the one down to fit, hence the smaller hole above the TV. Hope that helps! This looks great! How did you paint the backboard? Did you have to sand it down at all for the paint to stick to it? Thanks! My husband just spray painted it. No sanding necessary! Looks great! We’re doing the same thing. Got 3 hemnes bookshelves and the extension for the top. How did you guys deal with the edge/lip that the hemnes bookshelves have up to so it fits flush against the wall and so that in the end it all looks like one built in and not stacked? Thank you! The bridge and bookcase lips are the same depth so when placed on top of each other it naturally blended together. 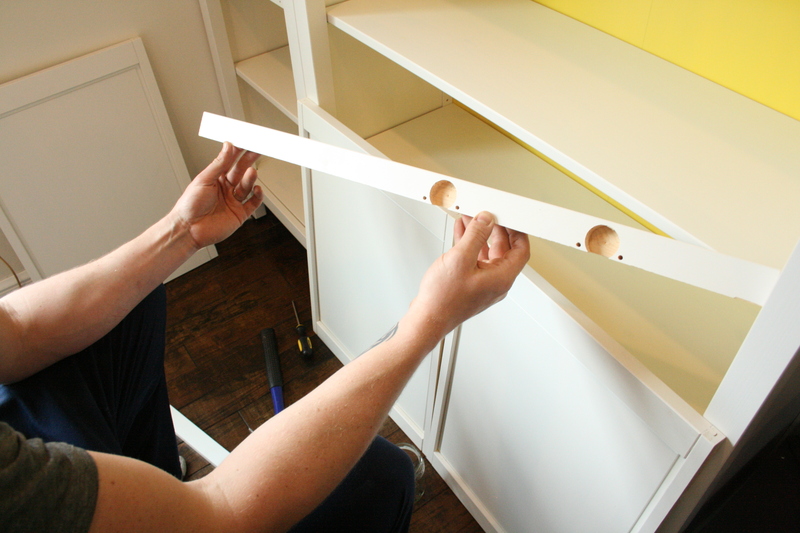 If there were any gaps between bookcases or the walls we filled with white calking. Good luck!